This from Tom Schaller @ FiveThirtyEigth.….. It basically reports that Congressman Luis Gutierrez is quietly pushing against his President…avocating Latino’s to seriously think about not voting in Novemeber……Just a partial following on the action would have serious consequences for Democrats…. Latino’s have the democrat’s attenntion..but the window for bill as contentious as Immigration is just about gone until the day AFTER the November elections…. But I see no alterative for the President and his party…. Everyone in the democratic camp better pray for majorities in the House and Senate…. Without them……Immigration and a lot of other things will be long gone……. This past weekend I attended the Midwest Political Science Association’s annual meetings at the Palmer House in Chicago. Local Congressman Luis Gutierrez gave the Pi Sigma Alpha lecture on Friday afternoon, and he spoke at length about immigration reform, the developing situation in Arizona, and his worry that President Obama and the Administration will not rise to the challenge. He did sugarcoat what he had to say. Although I didn’t have my digital tape recorder on hand to record his comments in regard to immigration and the Administration, I can assure you Gutierrez’ remarks were not as diplomatic as this recent press release on the subject, but rather were much closer tohis recent Huffington Post comments, in which he expressed his growing impatience with Obama. He also flatly called Obama’s promise to pass a comprehensive immigration reform bill in his first year a “broken promise.” More to the (electoral) point, Gutierrez has begun to openly suggest that he may consider encouraging Latinos to stay home this November which, if they did, would exacerbate the Democrats’ expected problems and electoral losses. Gutierrez is not your typical Obama critic, mind you. When most other Latino elected officials were lining up behind Hillary Clinton in late 2007, he sided with his fellow Chicagoan. That not only made him an outlier among national Latinos; it also made him an outlier in his own part of the city, where he says all of the Latino wards were carried by Clinton, not Obama–just as she didoverall in key states and nationally during the primary. In short, Gutierrez says he stuck out his neck for Obama. And now, in what he calls the “civil rights fight” of this generation, he wants the President to stick out his neck for Latinos, particularly those who Gutierrez predicts will likely be profiled for rounding up in Arizona. The House is open to an 'look at' an Immigration Bill….. if the Senate goes first?……..
On this Friday House Majority Leader Steny Hoyer (D-Md.) threw Senate Majority Leader Harry Reid a life line……. He invited Reid to see if he could put together some sort frame work for an Immigration Bill thus giving Reid a green light to be seen acting on the issue that will effect more than 105 of the voters in home state of Nevada…..
Reid is stuck at about 105 points behind the GOP field running for his job as US Senator back home….. Furthermore after Latino’s and Hispanics noise for the past week…..
Knowing an immigration debate could deeply damage their ability to hold on to their majority ahead of the mid-term election, House leaders reached an agreement with their members, the White House and the Senate ensuring that the Senate would have to pass immigration legislation before the House would follow suit. Senate Majority Leader Harry Reid (D-Nev.) has indicated a willingness to put a bipartisan, comprehensive immigration reform bill on the Senate calendar as early as this summer — a move that’s designed, in part, to strengthen his own reelection chances. Hispanic Democrats, primarily in the House, have become increasingly frustrated with what they believe are a string of false promises from their leaders — including President Barack Obama — to work to pass an immigration bill this year. Rep. Luis Gutierrez (D-Ill.) and, more recently, Rep. Xavier Becerra (D-Calif.), a member of the House leadership, have publicly aired that frustration, and with increasing frequency. The perception that their own leaders in the House are now backtracking on an arrangement made months ago in the face of Reid’s seemingly very real desire to move an immigration bill could only inflame those frustrations. I see this as dance that doesn’t get finished till After this coming November ..but before November 2012….. The House is open to an ‘look at’ an Immigration Bill….. if the Senate goes first?…….. Downtown Los Angles has an Immigration Demo….. Supporters of immigrant rights rallied for reform in Los Angeles on Saturday in a march that was scheduled to begin at 11:30 a.m. at Broadway and Olympic Boulevard, wind its way north to Temple Street and end back at the Olympic and Broadway intersection. The event is part of an orchestrated effort across the country to pressure lawmakers to move ahead with immigration legislation this year. 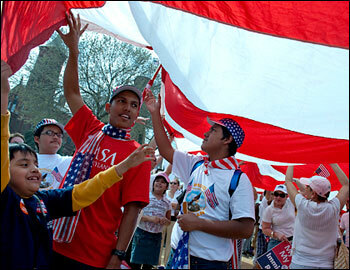 Last Sunday, tens of thousands of immigrant rights proponentsrallied on the National Mall in Washington. Sens. Charles E. Schumer (D-N.Y.) and Lindsey Graham (R-S.C.) outlined a framework for the legislation in mid-March that would provide a path to citizenship for some of the 11 million illegal immigrants in the U.S., enhance border enforcement efforts and create a program that admits temporary workers. Large Rally in Washington D.C. for Immigration……. Thousands of immigrants and their supporter’s gathered in Washington D.C. to protest no action from the White House on their promise to address the issue……while it was though they could attach an immigration Bill to the Healthcare Bill….that does not appear to be the case……..
Tens of thousands of immigrants and their supporters from across the United States packed the Mall on Sunday in a last-ditch effort to spur Congress and the White House to overhaul the nation’s immigration system and offer its 10.8 million illegal immigrants a path to citizenship this year against increasingly long odds. D.C. officials do not give crowd estimates, so it was difficult to determine whether turnout reached the several hundred thousand estimated by organizers. But the rally, which stretched from Seventh to 12th streets in a dense carpet of humanity, appeared to be the movement’s largest show of strength since 2006, when mass rallies in favor of a legalization plan erupted in cities across the country. As at past rallies by the movement, most of Sunday’s participants appeared to be Latino, including many who broke into repeated chants in Spanish, such as “Sí, se puede!” (Yes, we can!) But there were also displays of diversity, including a group of Senagalese immigrant women, who had perched tiny American flags in their traditional headdresses, and immigrant Thai families carrying signs written in the script of their native country as they pushed their American-born children in strollers. 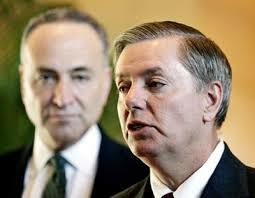 Senator's Schumer and Graham approach the White House on Immigration Reform…..